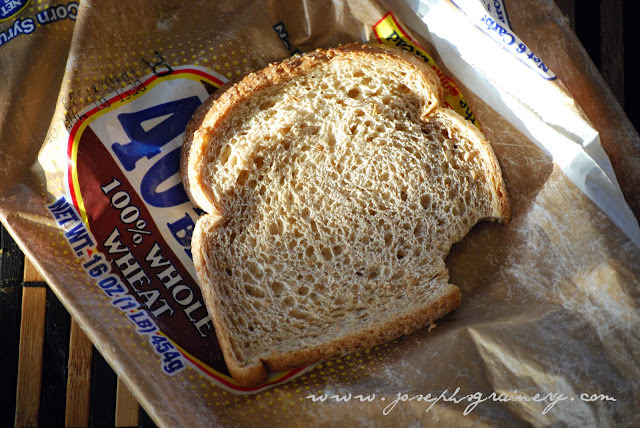 Joseph's Grainery: What's In Your Whole Wheat Bread? What's In Your Whole Wheat Bread? 100 % Whole Wheat Bread, looks healthy enough, right? What caught my Grandpa's attention though is along the left hand side of the photo (go ahead take a look): "BEST BY MAR 05". Eeeeek! Let me remind you that is now the 2nd half of 2010 and my Great Grandmother is very adamant that she'd only bought the loaf sometime in early July and stuck it in her freezer, then pulled it out a couple weeks prior to their discussion. 1. A printing error of some sort, and the loaf was not really manufactured in 2005. Could happen, but not very likely. 2. The loaf actually was made in 2005 and somehow through the magic of middlemen and wonderful preservatives didn't make it to the store shelves until just a few months ago. Scary if true. 3. My Great Grandmother, may have forgotten that she purchased the bread a few years back and it's been living in her freezer for quite some time. Now this could be the case, but for her age, my Great Grandmother is really "with it", and there are a few other logistical things that make this kind of impossible - she just moved back into the farmhouse a few years back, she'd been living in town and moved back out to the farm, so the bread would have had to have made the journey as well. Whatever the case may be, we are quite impressed that after being frozen, then sitting around for a few weeks, the bread still had not gone stale. Amazed, Grandpa asked if he could take the remaining pieces of the bread to show MaMa and I. Well, Grandpa was pretty busy and forgot to show it to us right away, so it road around in the back end of his pick up truck for the better part of a month before he showed it to us just the other day. Guess what? After at least a month and a half, if not two months of being out of my Great Grandmother's freezer the bread was still incredibly soft, squishy and still not showing any signs of going stale! The picture above was taken just the other day. So regardless of what this loaf's story is before my Grandpa got his hands on it, it makes you question, what in the world is in this bread that's kept it from not going stale and molding since it came out of my Great Grandmother's freezer almost two months ago??? There are definitely a few things in there I can't pronounce and certainly have no clue what they are. It's a little scary that there's something in this assumably "healthy" product that keep it "fresh" for quite awhile - whether it's 5+ years or a few months. 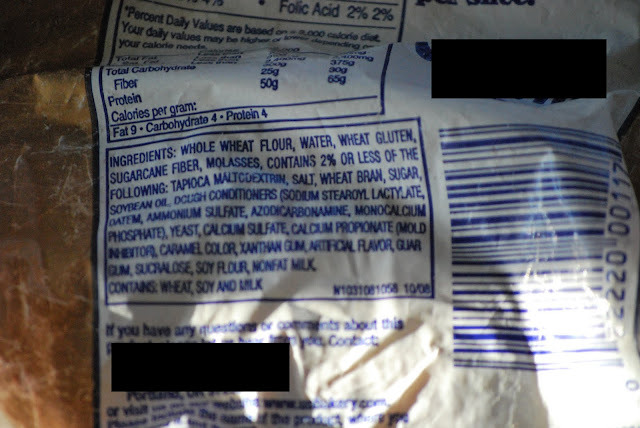 One question we have, if they have actual "whole wheat flour" in the bread, why do they need to add wheat gluten (3rd ingredient on the list)? Makes us wonder if it's truly whole wheat flour. 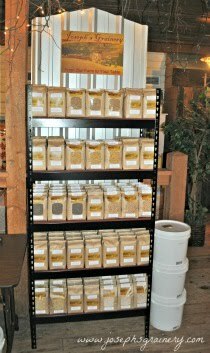 We can guarantee that Joseph's Grainery Whole Wheat Flours are truly "whole wheat". We simply put the whole grain into the mill, watch it do its thing and then bag the flour for you. It's that simple. It's ground fresh for your order and there is absolutely nothing mysterious added and nothing nutritional is taken away from it. Our flours don't need an ingredients list because the only thing that is in the bag is what's on the label - Whole Wheat Flour. So all of this to say, be aware of what's on a label, even if it appears to be healthy (i.e. 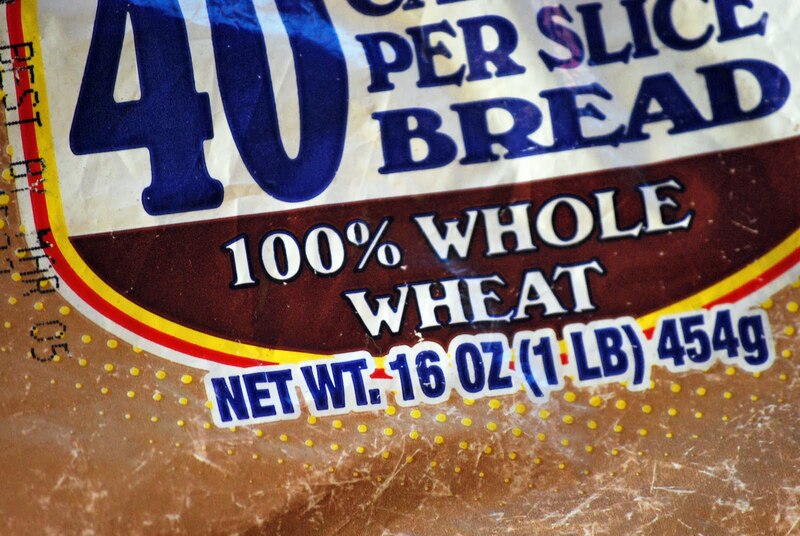 100% Whole Wheat Bread), it may still have a few mystery ingredients that will help to prolong it's shelf life.